Religion spans a wide range of belief systems, practices, traditions, and history. It is difficult to know how to appropriately behave in various religious settings since they are all so different. 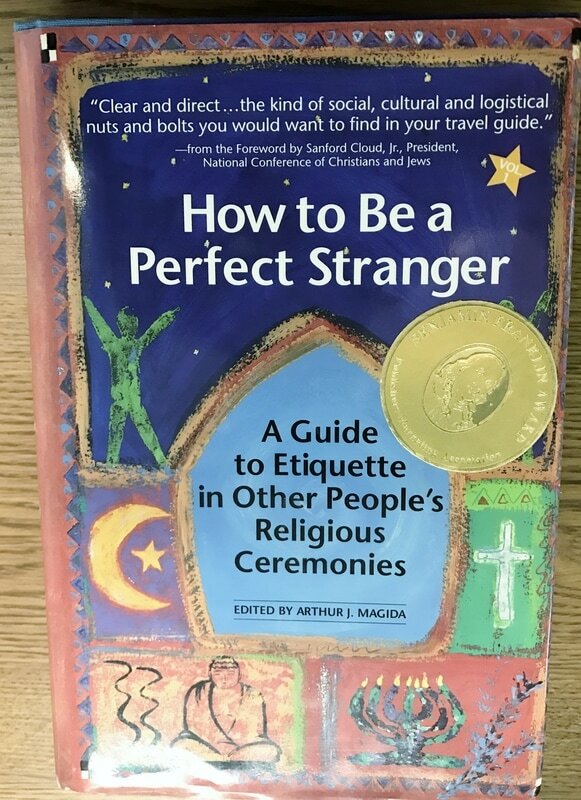 The book, How to Be a Perfect Stranger: A Guide to Etiquette in Other People’s Religious Ceremonies edited by Arthur J. Magida and Stuart M. Matlins breaks down each level of different religions. Each religion covered begins with a brief description of the history and beliefs of that religion. It is followed by information on a basic service. This information includes what to wear, what a sanctuary looks like, important notes about the service and how to behave during it, what happens after the service, general guidelines and advice, any special vocabulary, and finally a little more information about the religion’s dogma and ideology. The book continues in this fashion, highlighting the holy days and festivals for the religion and details about each life cycle event. The information is presented in a simple and easy to understand format that allows for anyone to know what to expect when visiting a religion that is not their own. This resource is not only great for preparing to visit a new religious institution, but it is also an excellent teaching resource. If you are teaching a comparative religion class you can use this book to help your students understand even more about the religion. Perhaps you want to go on a field trip with your students and you want them to know what to expect. You can use this book to help prepare them for the visit. If you are unable to actually visit a place of worship for the religion you are teaching about, this book is an excellent way to set the stage for your students to better understand. While each religion is informational in its own right, this book can also be used to compare and contrast all the different religions. Since every religion is laid out in the same format, it is easy to copy the pages of different religions and lay them out for students to look for similarities and differences between two or more religions. This allows for the students to better understand what the religion looks like in comparison to what they know about Judaism. The use of the book can reduce intolerance due to ignorance, and promote the concept that we are all, no matter our religion, b’tzelem Elohim (created in the image of God). There are many religions covered in the book. If you’re curious exactly which religions are covered, you can check out the table of contents on Amazon. This resource can really help teachers expand the Comparative Religions unit that can be found in our High School Curriculum Spiral. Looking at other religions can help us understand our own and how we interact with people of other faiths in our wonderful world.